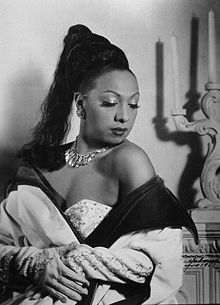 Josephine Baker (born Freda Josephine McDonald; 3 Juin 1906 – 12 Aprile 1975) wis a French vedette, sangster an enterteener, whase career wis centred primarily in Europe, maistly in her adoptive kintra o Fraunce. ↑ "Josephine Baker (Freda McDonald) Native of St. Louis, Missouri". Retrieved 6 March 2009. ↑ "About Art Deco – Josephine Baker". Victoria and Albert Museum. Retrieved 6 March 2009. ↑ Verany, Cedric (1 November 2008). "Monaco Cimetière: des bornes interactives pour retrouver les tombes". Monaco Matin. Retrieved 26 December 2015. ↑ "Visite funéraire de Monaco". Amis et Passionés du Père-Lachaise. Retrieved 26 December 2015. ↑ Baker, Jean-Claude (1993). Josephine: The Hungry Heart (First ed.). New York: Random House. ISBN 0679409157.